Last month I showed you the sweet little garter-stitch cardigan I knit for a new baby in the family, and lots of people have asked about the pattern. It's from a Patons booklet (no. 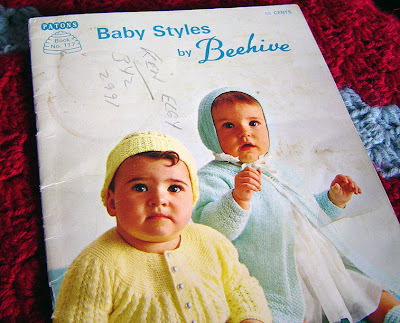 117) called "Baby Styles by Beehive." I just happened to do a quick pass through Value Village earlier today, and I came across a copy of this very booklet, so I paid the 50 cents and brought it home. The cover is coffee-stained and has some phone numbers jotted on it, and there are a couple of stains and pen marks on the pages inside. Would you like it anyway? Since several people have expressed interest in the garter-stitch pattern, I'm just going to do a random draw. You just have to leave a comment telling me you'd like this booklet. I'll keep it open for a week, since I'm going to be busy and away from the blog anyway. OK, so if you'd like this booklet, just leave a comment before Thursday, November 1, at 8:00 p.m. (Eastern time). Have a great weekend! I'm off to a conference tomorrow, so I'll see you next week. i love that baby sweater! great meeting you at rhinebeck last weekend - enjoy the conference. oh, i would love it! i can't tell you how many babies are brewing over here (in my family, at my workplace, my friends)... and i loved the sweater when you made it and was disappointed not to have the pattern. Oh, I loved that sweater. Put me in there please! Oh me too! Please put me in the drawing! You bet I'd like that booklet. I've never won anything, so it must be my turn. Well I would love it but I think I'm past my baby knitting days. Cute patterns though!!!! I loved that sweater you made and would love to get my hands on that pattern! Thanks for thinking of the blogosphere when you saw the booklet at Value Village! Too cute! I love it. 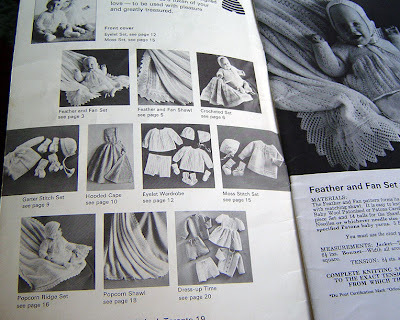 I would love to get my hands on these patterns because baby patterns nowadays are almost always worsted weight yarn knit on 6 mm needles. And I think these are way cuter. These patterns are a must have!! I'd really like to have this booklet! Thanks! I would love this! Very generous of you. You're so sweet to share! I hope you pick me (us) I have 6 more weeks to crank out little knitted things before the imminent arrival! I'm in! How sweet of you to share! Oh, wow! 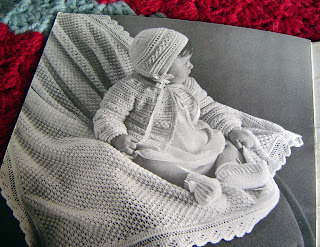 Those knitting things look like the garments on babies from the 40's and 50's. Ahem, that would be my classmates! Yes, please, I would like to have this book! i do know a few babies (and if my sister isn't as cursed as me...). the moss stitch set is OMG worthy! Let me into the draw too please! Plus i live in Montreal, so you won't have to pay for shipping/or it's really cheap. Please include me in the drawing! It's a sweet book and just the thing for the new babies in my life. Please pretty please pick me pick me!!! So so sweet. I love it, please count me in! I'll wear my lucky socks all week! Hoping to win! Oh, I'd looove to win this! I have a few babies popping up in my family this winter and patons booklets are pretty difficult to come up with here in Denmark. the last thing I need is to start another project, but I love that pattern so count me in! lovely lovely! Please count me in and thanks for thinking of your readers! That pattern booklet looks like a treat. Please do enter me in the drawing. I'm new to your blog, and liking it. 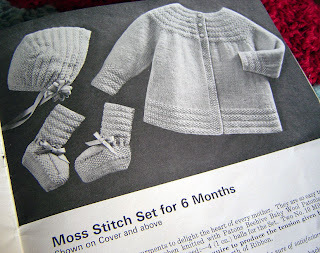 Those are adorable, and I think my aunt used that very same pattern book to make me a sweater when I was a baby! The baby shawls are seriously making me long for babies! Mine are 16 and 19, but I can still pretend. Thanks for picking up the book. My fingers are crossed. Those are adorable patterns. I would love to have it. Thanks for offering it up. I will be an auntie again in Jan. Must have sweater pattern. So cute. Please enter me in the draw. Please enter me in the drawing too! I love the old patterns. ooh, I'd love it! i think everyone i know is having babies. Thank you for having this drawing; the baby sweater is lovely. Please count me in. Thanks. Thank you for show this booklet. I love the old patterns. It looks so sweet. It's a great booklet - I have a couple of copies and use it all the time. However I have to start at the 6-12 months sizes, as babies today seem to run big!